Two questions I get asked frequently are how to make workwear appropriately stylish/modern and how to dress in a chic but comfortable way for the weekend. 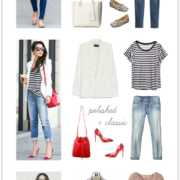 So today I’m sharing two outfit ideas – one for each of these situations. When it comes to office attire, it’s important to let your personality shine through. For me, that means mixing tailored items with a little bit of edge (like a moto jacket in an unexpected hue). This balances out more conservative pieces and helps the outfit feel less stuffy…while a buttoned-up blouse + slim cropped trousers keep it classic & sophisticated. On the weekend, it’s all about comfort – especially if you work in an office where you have to be dressed up all week long. But wearing comfortable pieces doesn’t mean you are confined to sweatpants & sneakers. Choose a soft sweatshirt, easy knit skirt & ankle boots for an outfit that looks like you put some effort into it…without sacrificing the coziness you crave. Add a vest or denim jacket on top & you’ve got a casual look with just the right amount of polish.